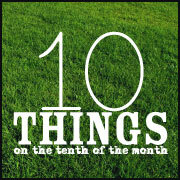 I like you're choice for 10 things on the 10th. Simple but complete! Love your listing of the here and now for you! TFS! That's one busy list, good luck with it and as for number 10. Sigh, they do don't they. Gosh quite a list - you certainly sound busy. Have fun! I love exercising in the sunshine too:) Oh and scrapping!! What a great list; love how you kept it simple but added links! Great List! Little ones always grow up too fast. Great list!! You are one busy gal! Oh my goodness, those enchiladas look scrumptious!! You are ONE BUSY LADY! !